Ok.....the 2 footprints are out, too many people have them. Have seen the baby`s name inside a footprint, looking like it is the wrinkes/lines of the foot. Also have seen the letter blocks used to spell the name. Any other ideas? Not sure of any good ideas but here are a few to avoid. And if those are not enough there is always this option. lol.....yeah, not going that direction. I`ve got the footprints of my son, then the handprints of my daughter...they were step one of a family based design on my shoulder/chest/back...do what you want, who cares who might already have something like it. Well, every tattoo I have, I drew myself, that way I`ll never see my tats on anyone else, plus they mean more to me. This is what I did for my 3 kids. I put all their initials into a design I made. The skin is the letters. KAR, ALR, and JTR, in order of their age from top to bottom. Bad pics(too much flash), but you get the idea. Make it personal and work with a tattoo artist to create something unique. Good luck, and post up when you finally do something. Please promote "Baby Tattoo Ideas?" 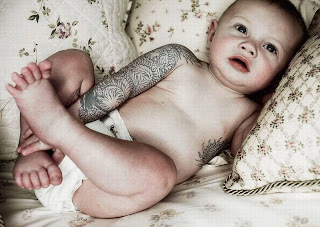 Forums : Community : Baby Tattoo Ideas?